Resources and information on bereavement and grief for the public and healthcare professionals. Children and adolescents grieve in their own way after a death, and their reaction will depend on the circumstances of their loss. A child's way of grieving can be quite different to an adult's. Children's grief often comes in waves; children tend to dip in and out of grief rather than have prolonged periods of grief. As with adults, there is no 'right' way to grieve, and most children find a way to cope with loss. If you are a teenager whose friend or relative has died, this book was written for you. The author explains what to expect when you lose someone you love, including normal reactions to the shock of death, how grief can affect your relationships, how you can work through your grief, and more. With sensitivity and insight, this series offers suggestions for healing activities that can help survivors learn to express their grief and mourn naturally. Teens grieve differently from adults and often get lost in the shuffle after the death of a loved one. Weird Is Normal When Teenagers Grieve is unique because it is a self-help book for grieving teens written by an actively grieving teen. Author Jenny Lee Wheeler lost her father to cancer when she was fourteen and validates for her peers that they have the right to grieve in their own way and according to their own timetable, that their grief attacks might be different from those of adults around them, and that they aren't going crazy if they see signs from their loved one. In this unique and compassionate guide, renowned grief counselor Helen Fitzgerald turns her attention to the special needs of adolescents struggling with loss and gives teens the tools they need to work through their pain and grief. Writing not only about but also for teenagers, Fitzgerald adeptly covers the entire range of situations in which teens may find themselves grieving a death, whether the cause was old age, terminal illness, school violence, or suicide. She helps teens address the gamut of strong and difficult emotions they will experience and the new situations they will face, including family changes, issues with friends, problems at school, and the courage needed to move forward with one's own life. The Irish Childhood Bereavement Care Pyramid was developed by the Irish Childhood Bereavement Network as a guide for professionals and concerned adults in identifying and responding to the needs of children and young people who have experienced loss. The pyramid is supported by a document which includes more detail on each of the components of the pyramid, which can be found here. A printable verision of the pyramid is available here. 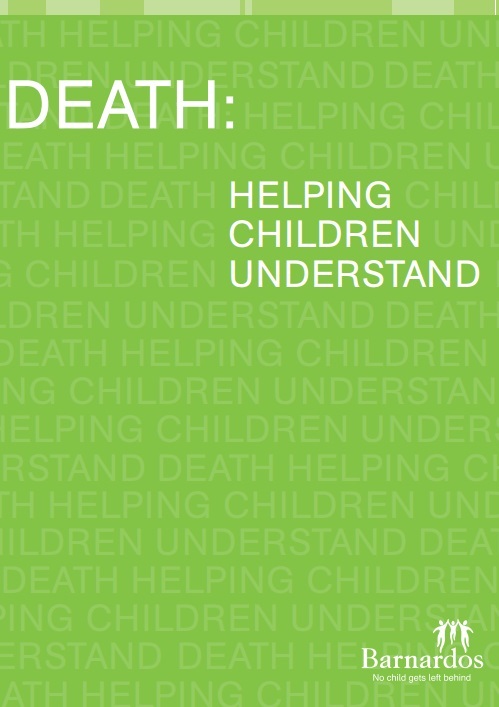 This booklet aims to give some explanation of how children at various stages of development understand death. It will help those who are faced with the difficult task of talking to children about death and dying. 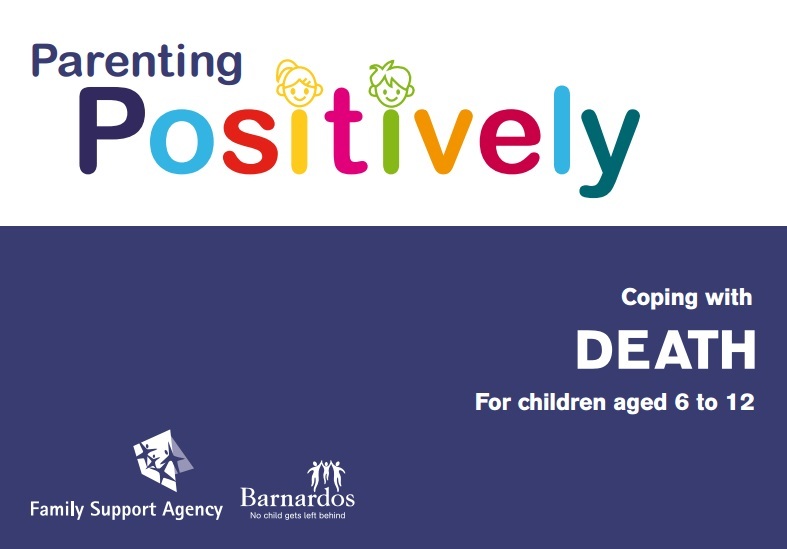 This leaflet provides a basic overview of children's grief and covers how bereaved children at certain ages might react and what support they will need. 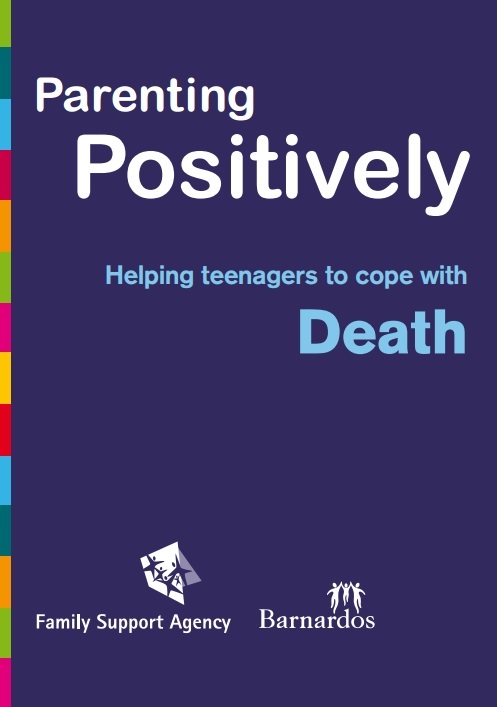 This booklet provides information and guidance to parents supporting a bereaved teenager and includes answers to frequently asked questions about teens and grief. 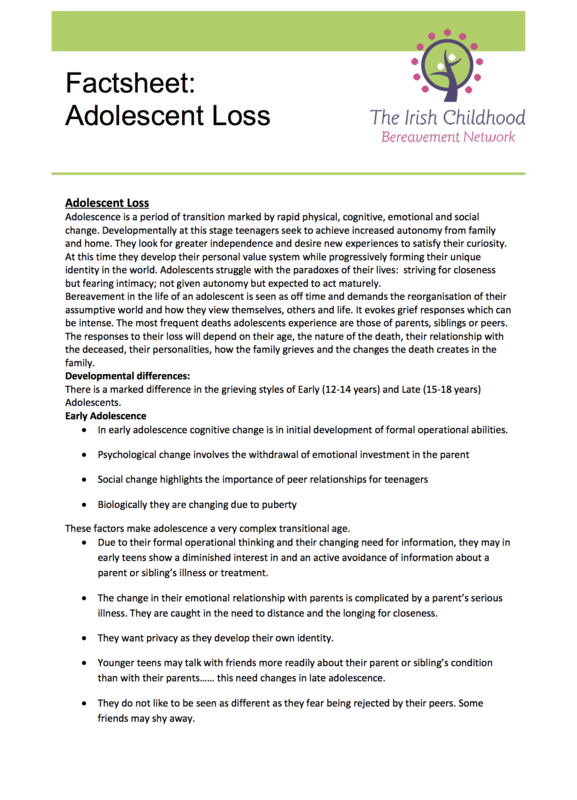 This factsheet provides a basic overview of adolescent loss and explains the differences in grieving behaviour in the different stages of adolescence. This booklet is for children aged 6-12. It will help children understand more about death and the feelings they will experience if someone has died. 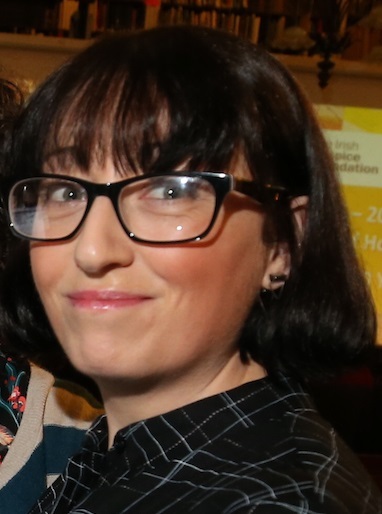 The ICBN is an organisation providing information and support to families, carers and professionals working with bereaved children in Ireland. This site explores how children understand death and what adults should say to them. 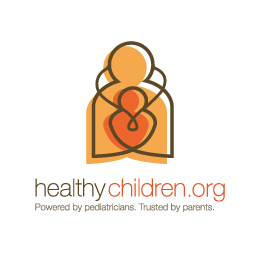 HealthyChildren.org is maintained by the American Academy of Pediatrics. Winston's Wish is a childhood bereavement charity in the UK. The site offers information and guidance on the supporting bereaved children and the needs of children and young people when someone important in their life has died. Barnardos Children’s Bereavement Service is a service for children and young people who have lost someone close to them – like a parent or a sibling - through death. The Dougy Center provides a safe place for children, teens, young adults and their families who are grieving a death to share their experiences through peer support groups, education, and training. This site includes helpful information about helping a grieving child or teen. Dr. Daniel Schaefer, working with child psychologists and trauma experts, and drawing on more than three decades of experience with families in crisis, has written a practical guide for anyone who works or lives with children—parents, caregivers, counselors, or teachers—to respond to their inevitable questions about loss and change, life and death. He provides strategies to assist children with grief and trauma and offers time-tested advice and language that children can understand. This booklet addresses the many questions that arise for parents and children when somebody close has died. Bringing together fourteen experts from across the United States and Canada, Bereaved Children and Teens is a comprehensive guide to helping children and adolescents cope with the emotional, religious, social, and physical consequences of a loved one's death. Topics covered include what to say and what not to say when explaining death to very young children; how teenagers grieve differently from children and adults; how to translate Protestant, Catholic, or Jewish beliefs about death into language that children can understand; how ethnic and cultural differences can affect how children grieve; what teachers and parents can do to help bereaved young people at school; and activities, books, and films that help children and teens cope. This book offers a fresh insight into working practices with children and young people who are experiencing the death of a family member, friend, school peer or in their social network. Bridging the gap between theory and practice, the book's practical skills focus is informed by the latest research findings on children and young people's experience of grief. Living With Grief: Children, Adolescents, and Loss features articles by leading educators and clinicians in the field of grief and bereavement. The book includes a useful bibliography of age-appropriate literature for children and adolescents. Capturing from the start that 'Childhood is, and always has been, a vulnerable time, ' we have a rich in gathering of contributed pieces that bring us into the raw, fragile arena of children traumatized by life events and behaviors..." --Illness, Crisis, and Loss Balk and Corr again have edited a book that will set the direction of the field for yet another decade....Caregivers can count on this book...for insight and intervention." Written by a trained psychotherapist, journalist and parent, this reassuring picture book explores the difficult issue of death for young children. Children's feelings and questions about this sensitive subject are looked at in a simple but realistic way. This book helps them to understand their loss and come to terms with it. This book offers a structure and an outlet for the many difficult feelings which inevitably follow when someone dies. It aims to help children make sense of their experience by reflecting on the different aspects of their grief, whilst finding a balance between remembering and having fun. In this modern-day fable, a woman who has suffered a terrible loss cooks up a special batch of "tear soup," blending the unique ingredients of her life into the grief process. Along the way she dispenses a recipe of sound advice for people who are in mourning or know someone who has suffered a loss. An appendix in the book contains a helpful listing of grief support groups for a variety of situations. When the death of a relative, a friend, or a pet happens or is about to happen, how can we help a child to understand? Lifetimes explains that all things have a beginning and and ending, and describes life and death in a sensitive, caring way.